When you attend University of Phoenix, you’re never alone. From enrollment through graduation, we are by your side with support, resources and guidance to help you along the way. Our students enjoy access to innovative learning resources, leading-edge curriculum and the experience of friendly and dedicated staff. We also have an extensive alumni network and network mentoring program ready to offer support and insight. With University of Phoenix you have personalized support all along the way. 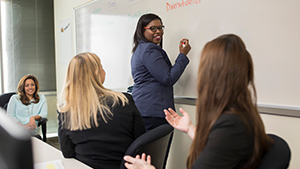 University of Phoenix students have a Graduation Team of representatives to smooth out the bumps on the road to success. This includes an enrollment representative, a finance representative and an academic representative. Our team helps you get and stay on track, from day one through graduation. Students at University of Phoenix have extensive resources at their fingertips. All that’s needed is a computer and a reliable internet connection. This includes a comprehensive digital library that’s updated by a full time team of librarians and specialists who also assist students in research. Students also have access to online math and writing assistance, tutorials, technical assistance and more. University of Phoenix is there for you from start to finish. Our representatives are there to help you enroll and plot a course towards graduation. After you graduate, we’re still here to support you as you enter your new career. As a graduate you have access to career services through the PhoenixLink(SM) system which can help you polish your resume, learn interview skills and gain access to jobs for our graduates.